Re: Our Iron Cage, by Triple Canopy Did You Get the L? 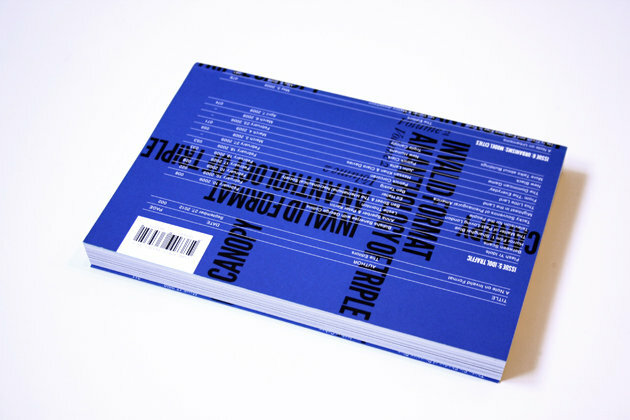 Invalid Format: An Anthology of Triple Canopy, designed in collaboration with Project Projects, is at once an archive of Triple Canopy’s widespread publishing activities and a translation into print of projects that originally appeared in other forms. The design of Invalid Format reflects this problem: How might works produced for the screen be transposed to the codex in a way that recalls that former context, though not slavishly, and while also fully inhabiting the page? How can the form and function of interactive, audiovisual works be degraded elegantly, without disappearing entirely, in print? Invalid Format will be published at least annually and is available at select bookshops worldwide. The second volume of Invalid Format includes artist projects and literary work published from early 2009 through mid-2010, documentation of public programs, and a sampling of foundational correspondence. Contributors include Sophia Al-Maria, Bidisha Banerjee, Gil Blank, José León Cerrillo, Joseph Clarke, Joshua Cohen, Teddy Cruz, Ed Halter, Lucy Ives, Victoria Miguel, Joe Milutis, New Humans, Hassan Khan & Clare Davies, Karthik Pandian, Lucy Raven, Luc Sante, Nathan Schneider, Molly Springfield, Ben Street & the International Necronautical Society, Dan Torop, and Zs & Josh Slater. Distributed in North America by RAM Publications and in Europe via Invalid Format co-publisher Sternberg Press. Major support for Invalid Format has been provided by Furthermore: a program of the J.M. Kaplan Fund as well as Triple Canopy's Publishers Circle.